MAC (Mount Airy Contemporary) at Intuitive Art Space is pleased to present Constructed Nature, a sculptural installation by Emily White. Originally installed in 2014 at the Philadelphia Airport as part of the Art at the Airport program, Constructed Nature is an elegiac sculptural work depicting a lone bison followed by a flock of passenger pigeons. Endangered and extinct species move through visual space in what appear to be varying degrees of construction - the animals’ wooden substructures are left exposed to the viewer. These sculptures call to mind dioramas in natural history museums. Unlike dioramas, where the flora and fauna are frozen in time, this work shows two species in transition. On first examination, the viewer may first read these objects as under construction, a work in progress toward completion. One can, however, alternately read the species depicted as disappearing or de-constructing. The work carries an implicit environmental message that species are ephemeral and vulnerable. Emily White was born in 1987 in Brockton, MA. White received her BFA from Massachusetts College of Art and Design (Boston, MA) with a focus in sculpture. White has received awards including the Wind Challenge (Fleisher Art Memorial- Philadelphia, PA) and the Helen Blair Crosbie Sculpture Award (Massachusetts College of Art and Design – Boston, MA). She was nominated for the International Sculpture Center’s outstanding Student Achievement in Contemporary Sculpture Award for two consecutive years (2010, 2011). White's work is currently on display at the Peabody Essex Museum. She has had solo exhibitions at View (Old Forge, NY) and Penn State Altoona (Altoona, PA). 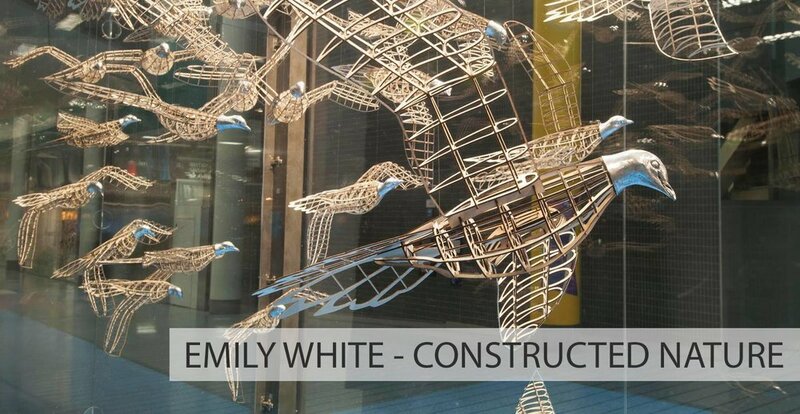 Emily White has had sculpture displayed in public spaces such as The Philadelphia Flower Show (Philadelphia, PA), the Philadelphia International Airport (Philadelphia, PA), and the Massachusetts Transportation Building (Boston, MA). White’s work has been in group exhibitions in the US and abroad including shows at The Philadelphia Art Alliance (Philadelphia, PA), James Oliver Gallery (Philadelphia, PA), The Royal Castle (Warsaw, Poland), City Hall (Philadelphia, PA), Pterodactyl (Philadelphia, PA), Annmarie Sculpture Garden & Arts Center (Solomons, MD), and Gallery 263 (Cambridge, MA). White has been featured in publications such as Textile Fiber Forum Magazine (Neroli Henderson), Contemporary Art of Nature: Mammals (Ashley Rooney), and The Whitefish Review. Emily White now lives in Philadelphia and works for the Philadelphia Mural Arts Program. MAC @ IAS is a partnership between Mount Airy Contemporary and Intuitive Art Space. MAC (Mount Airy Contemporary) has been presenting exhibitions in northwest Philadelphia since 2009. Andrea Wohl Keefe and Colin Keefe have been curating small group shows, primarily contemporary, regional artists. Shows have been exhibited in a carriage house behind their home. They are pleased by the opportunity to present exhibitions at Intuitive Art Space. Intuitive Art Space, in partnership with Mount Airy Contemporary, is a new community gallery located at the corner of Main and Rector Streets in the Manayunk neighborhood of Philadelphia. Quarterly exhibitions, utilizing the large windows of the EY Intuitive office, will be viewable to pedestrians day and night.